Hortus Camdenensis | Olearia argyrophylla (Labill.) F.Muell. ex Benth. Olearia argyrophylla (Labill.) F.Muell. ex Benth. 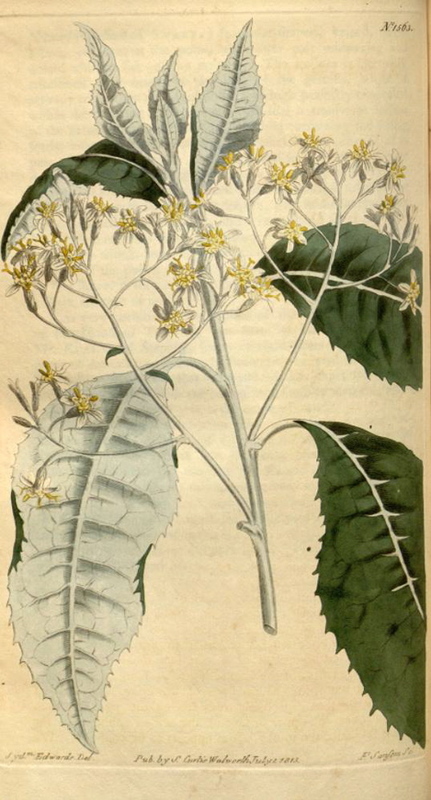 ‘Thriving plants of this Aster have for some years been to be seen in several collections about town; and are much admired for the delicate scent of musk, which the leaves retain for a long time after they are dried, as well as when recent. […] Introduced, according to Mr. Aiton, in 1804, by Messrs. Lee and Kennedy.’ [BM t.1563/1813]. Listed in all published catalogues [T.72/1843]. It occurs mainly in dry sclerophyll and on the margins of rainforest forest south from the Blue Mountains [FNSW] and was probably collected locally by William Macarthur.